Wie pumpt man destilliertes Wasser in den Wasserwirbler? Was ist der Unterschied zwischen basischem ionisierten Aktiv-Wasser zu AQUADEA Kristall-Wirbel Wasser ? The AQUADEA Crystal and Vortex. Technology for the growing new society. 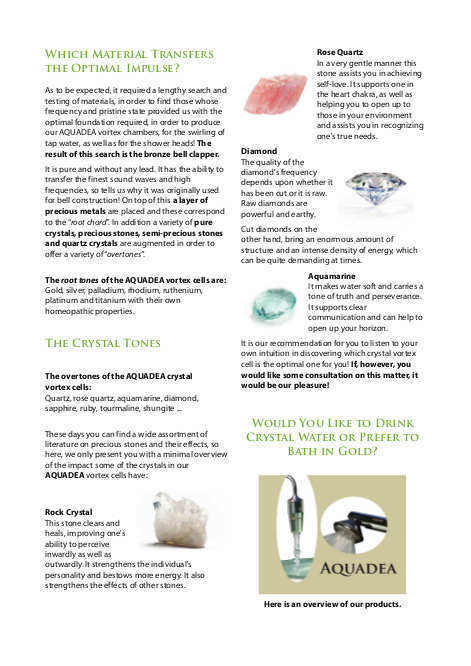 Home » English» The AQUADEA Crystal and Vortex. Technology for the growing new society. This information most likely comes to you today because you have already been informed about our innovative products in the area of water vitalization. 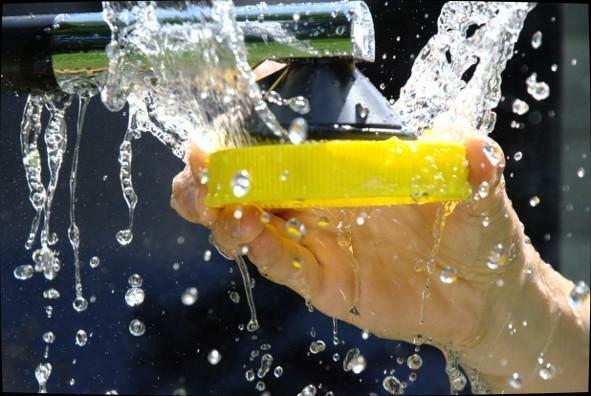 These products incorporate the ingenious vortex technology. 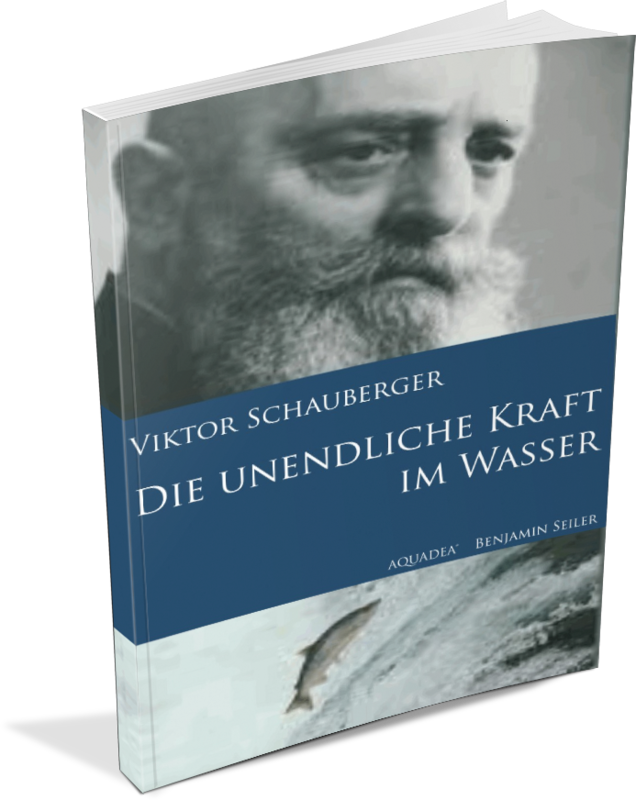 It was our mission to build upon and further the fundamentals established by Viktor Schauberger regarding water vortices. We are more than happy to say that our actual vortex technology including its vortex cells is one of a kind! Furthermore it is a pleasure for us to discover that you have become interested in creating your life in a more conscious manner. In some respect this i s almost inevitable. When this happens it becomes a natural that you then begin to inform yourself about our commonly shared fundamental element in life “water”. In following many other well known mystics, healers, physicists or even entire cultures – whether Aztecs or Egyptians – we also started off onto our own search for answers. One of the questions which captured our interest was: When and why do we experience things as: well integrated, harmonious, beautiful and pleasing? coherency of parts, as well as their totality and how this relates to harmony. Those objects, such as a house or a table, which are produced in accordance to the Golden Ratio, allow the observer precisely this very harmonious experience referenced in our question. The Golden Ratio is the foundation upon which our vortex cells are based. A further innovative characteristic pertinent to the construction of the vortex cells is the Fibonacci Sequence which gives rise to the Golden Spiral. Both Leonardo Fibonacci and Viktor Schauberger were observers of Nature. 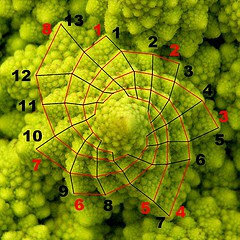 Fibonacci was the first to discover that nature followed a simple mathematical principle. This was true for every plant as well as many organisms, as was discovered e.g. in a snail's house. The growth of this house followed congruently a specific numerical sequence: 1, 1, 2, 3, 5, 8, 13, 21, 34, 55, 89, 144, 233, and so on. This means that every following Prime Number was the sum of the addition of the last two numbers. A fundamental statement of Viktor Schauberger was: “You are turning incorrectly...” It's about implosion, that is to say about “a force which is directed inwardly” and not an explosion which is directed outwardly and also diffuses. The plastic lid is pulled up through the suction and the vortex activity. Through the suction the plastic lid is held and turned. All that we don't know about water still awaits our discovery. Schauberger had postulated certain bioenergetic, essential metals as well as the practical implementation of implosions. 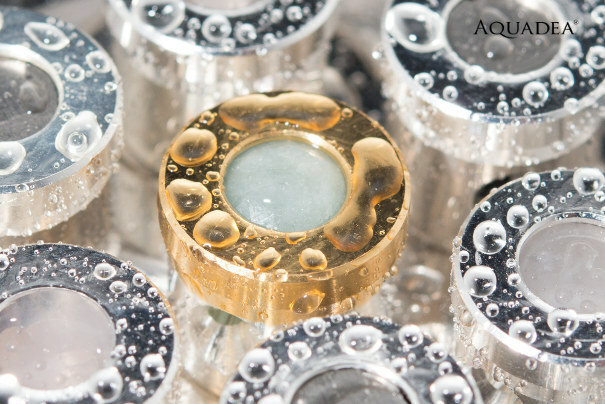 AQUADEA has consistently contributed to the development of this knowledge by increasing the speed at which the water is moved through the vortices and by the utilisation of crystals! YOU WILL FIND THIS AND OTHER TEXT HERE AS PDF FOR DOWNLOAD. vortex cells serving as force fields and this being independent of whether they are in our AQUADEA showers or in the tap water vortices. Meanwhile science has proven that matter is not a solid substance. There are theories about the concept “matter” which state that it is comprised of energy. A very essential aspect of energy is its characteristic as “a force or a power having an inward effect”. This means it has the power or potential to move or change something. When two forces of equal power converge, this leads to a point of standstill. This can easily be experienced, e.g. in the area of music. When two opposing vibrational waves, having the exact same characteristics, converge, a standing wave is created. The 'standing wave' continues to vibrate in time but not locally. 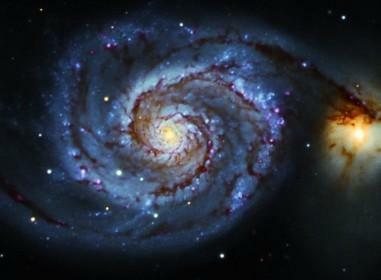 We have a similar constellation when it applies to the convergence of whirlpools. When two whirlpools merge a very complex 'standing wave' arises. We can see this in the example of spaces or rooms where argumentation has occurred. One can frequently perceive a tension in the air when initially entering this area. This is also an example of such 'standing waves' which are of more subtle frequencies than tones. Research in the area of quantum physics amazed scientists, when they discovered that quanta behaved differently when it was observed, than when not observed. 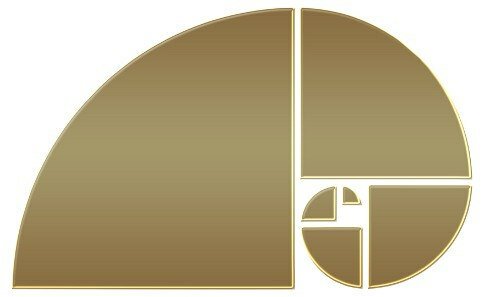 Flower of Life; the Golden Ratio, as well as to the Fibonacci- Sequence. A Torus arises in the center of these cells! It is by virtue of this very exact geometrical structure that many people experience a build up of an “energetic field” (a force) whilst showering. Some of those of you, who are clairvoyant or socalled “sensitives”, can even see this energy field with its play of colours. form of compressed energy or radiation. 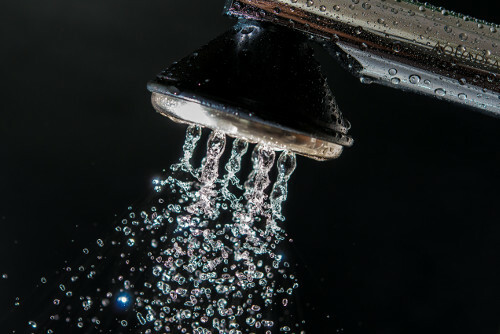 In order to give you an understanding of how the AQUADEA crystal and vortex technology works and thereby affording you an easier utilization of the AQUADEA Tap water vortices and shower heads, it's important for you to know of this energetic aspect. In all of the vortex cells pressure is transformed into suction (Victor Schauberger principle). In order to achieve this, water pressure is required. In most of the cells a pressure measuring two bar is necessary- or a flow from about 1.5 Liters per Minute. The nano-cells require a flow-rate of minimum 0,3 liters per minute. 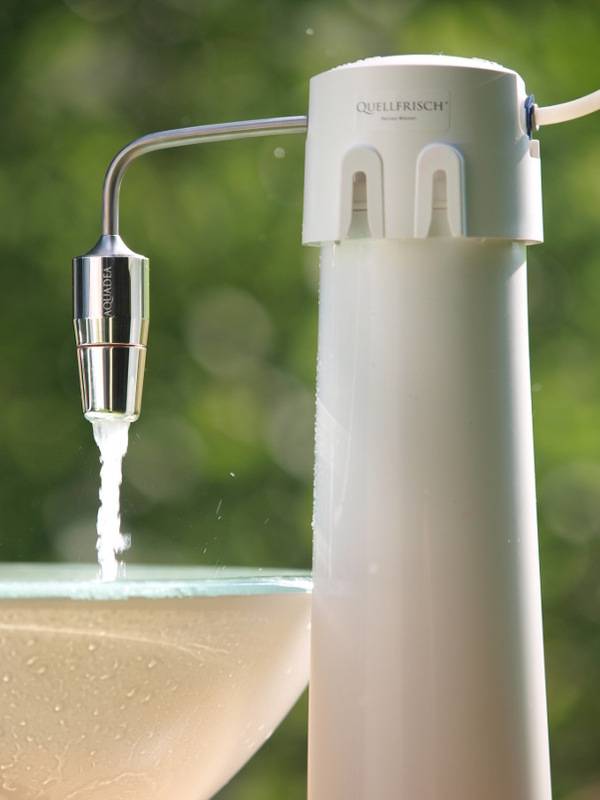 Consequently most of the reverse osmosis-systems can be equipped with a tap water vortex swirler. By reason of their structure the vortex cells draw the water, swirling and filling it with air, upwards to the top. Consequently from the very beginning, two primary swirls arise which mutually accelerate each others speed, whilst simultaneously swirling upward into and through an ever narrowing cell space. At their highest rate of speed they converge at the Zero point. Here the water clusters are more or less “pulverized” and the clustered molecules of oxygen are dispersed. The resultant aerated water now contains more free oxygen molecules, which rotate in the form of micro and nano swirls. This in turn enriches the water with further oxygenation. A simple analogy, to help you visualize this process, could be to imagine having a ball and out of this one ball many small balls would arise. The available surface, i.e. the bonding capacity of the oxygen in the many smaller balls, is radically increased and energized. the more coherency will arise in that space. Coherency in the context of laser light means bundled, concentrated, energetic and shows a consonance amongst the photons. show a coherency with the basic structure of the universe and with matter itself. Coherency could also be described as the dissolution of separation or as proximity a nd onsonance. Within a psychological context, it could be described as the increased ability of man's awareness to mentally and emotionally penetrate things. 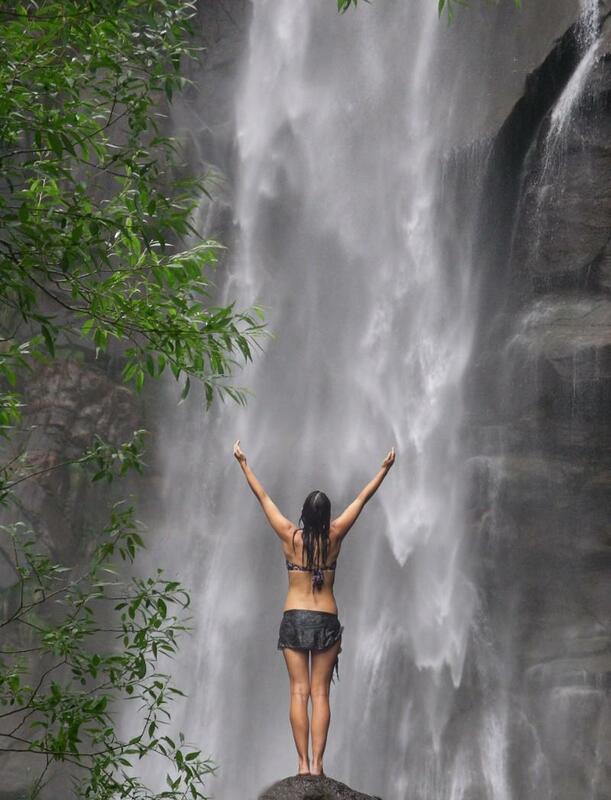 experienced when we are in a pristine area of nature or in the presence of a waterfall. also transferred into that space! just letting go on different levels. environment is, the slower the field of energy seems to expand. Theoretically the oscillation of the crystals would expand immediately. However, when the environment contains an element of chaos, it seems more difficult to perceive this oscillatory expansion or to perceive the arising coherency. When the AQUADEA LifeSource Vortex or the LifePower Shower Vortex is turned off, it seems as if the original condition within the room returns. Despite appearances, a residual change within this space can verily be detected. Gradients of effortlessness and joy can begin to manifest. Our Body also Benefits from the Swirled Aquadea Water! shore of a leveled canal. The water boringly moves along and dully makes its way along its limitations. How does that feel? 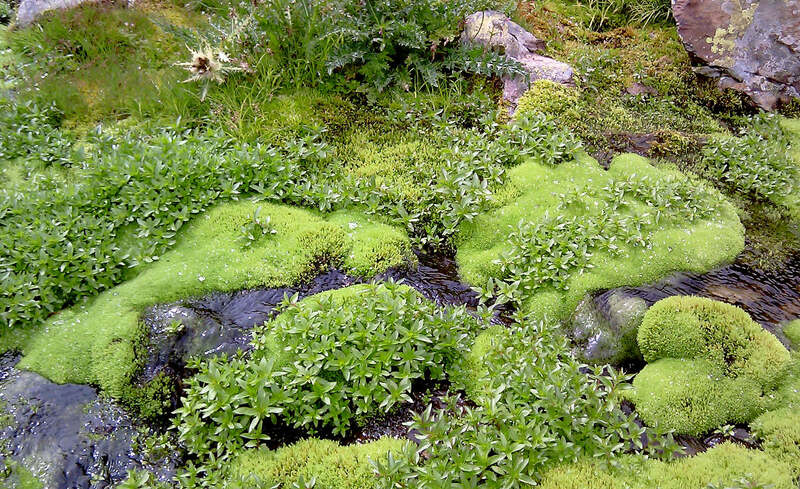 Wouldn't you rather stand next to an invigorating mountain stream; one which brings fresh and flowing water through its twists, cragginess and different courses! Here you can feel life pulsating! This is a place where one would like to stay! Here it is difficult not to feel good nor happy! i.e. nature has: The swirling causes water to revitalise! This invigoration can easily be experienced through the swirling which transpires in our AQUADEA vortex cells. Those are just some of the statements from our customers, who have used either the tap water vortex swirler or the AQUADEA shower head. A decisive factor is that a changed quality in the water is perceptible! It is softer, clearer and has more flavour! Either through drinking, showering or bathing in this water we can affect and manifest a long term improvement in our well being and accumulate more life affirming energy! The reason that our body cells sometimes show initial reactions, to the vorticity of this water, has to do with the body's adaptation to a higher orderliness in its structure. We are presently working on documenting the different processes within the body system. 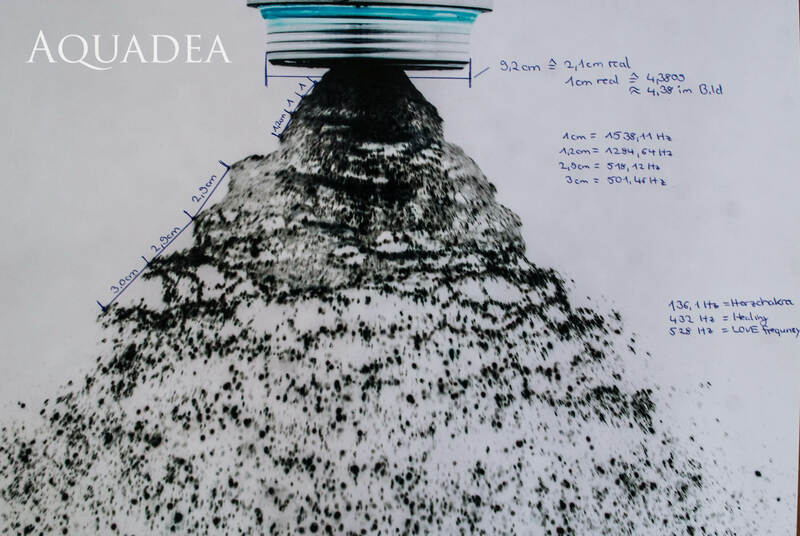 You are invited to share with us: your experiences, investigative results or realizations regarding the AQUADEA water! Which material transfers the optimal impulse? As to be expected, it required a lengthy search and testing of materials, in order to find those whose frequency and pristine state provided us with the optimal foundation required, in order to produce our AQUADEA vortex chambers, for the swirling of tap water, as well as for the shower heads! The result of this search is the bronze bell clapper. offer a variety of “overtones”. Gold, silver, palladium, rhodium, ruthenium, platinum and titanium with their own homeopathic properties. 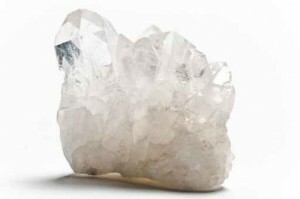 This stone clears and heals, improving one's ability to perceive inwardly as well as outwardly. It strengthens the individual's personality and bestows more energy. It also strengthens the effects of other stones. In a very gen tle manner this stone assists you in achieving self-love. It supports one in the heart chakra, as well as helping you to open up to those in your environment and assists you in recognizing one's true needs. powerful and earthy. Cut diamonds on the other hand, bring an enormous amount of structure and an intense density of energy, which can be quite demanding at times. open up your horizon. It is our recommendation for you to listen to your own intuition in discovering which crystal vortex cell is the optimal one for you! If, however, you would like some consultation on this matter, it would be our pleasure! Would You Like to Drink Crystal Water or Prefer to Bath in Gold? 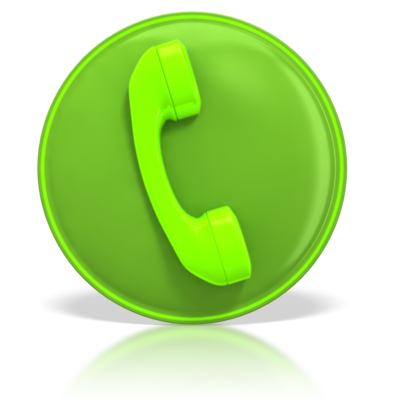 Please give us a call or send an email ! 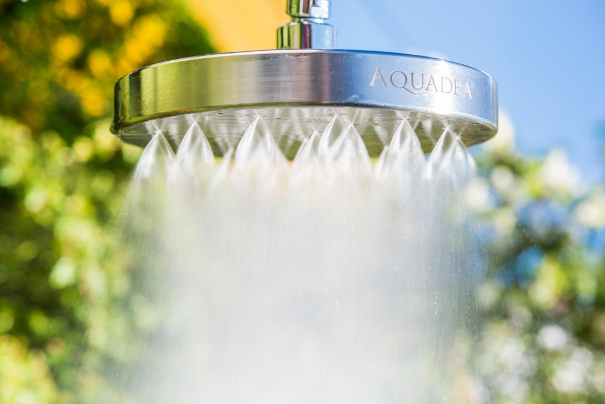 The AQUADEA Shower heads are equipped with five or seven vortex chambers in a sequential alignment. They can be ordered with or without the overtones from the crystal stones. However, in combination with the respective materials (root tone) and the selection of the desired crystal (overtone), very different qualities and tones can be manifested. Here will you find a survey about the aquadea vortex shower heads. The new shower-head named „True Self“ with its crystal vector , was inspired by the experience of overflowing abundance and an unobstructed access to all of one's abilities and talents. ... for more please klick here. Our Aquadea implosion vortex chambers have the property that they build up a growing ethereal torus vortex field. Each crystal has an etheric field. Each crystal radiates certain healing frequencies. The incredible difference between the field of a crystal and an Aquadea Implosion vortex chamber is that the field of the vortex chamber becomes larger and larger the longer water flows through the vortex chamber in one piece. In this way, several kilometres of diameter can be well harmonised and revitalised within days. Life energy is distributed into the environment. People become more stable and less susceptible to influence. This extraordinary shower-portal consists of 28+1 crystal vortex cells which have been brought into the form of the Flower of Life! 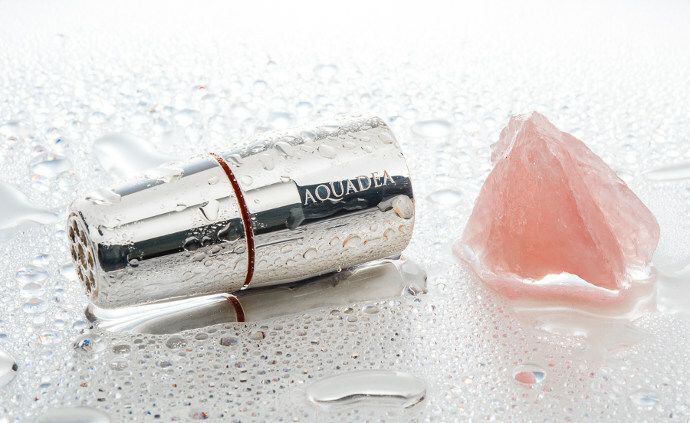 The extremely strong intensity of the many AQUADEA cells, the precious metal and the rock crystal are awesome! The water bubbles softly forth and gently bathes the skin. It feels fantastically gentle and playful and the arising energy field invites you to invigorate yourself! It's not only fun to shower beneath it, but it also lends itself as a spouting fountain or waterfall to be enjoyed continuously, e.g. in parks, gardens, hotels or Spas. This water gateway exudes a strong attraction and fascination and creates a center of energy! You just feel good being in its vicinity! Made of pure titanium, silver and crystal. In Germany. 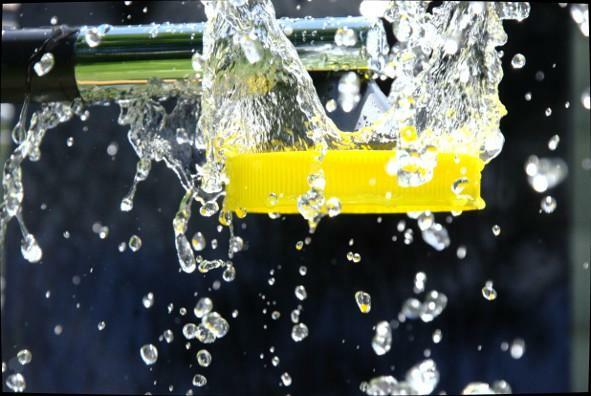 It is seawater resistant, cleanable and extremely water-saving. It only needs about half the water of a regular maxi shower. With incredible fine water and high-life energy. The recommended retail price for the basic model is around € 3900 excluding tax. Aquadea - Our Shared Vision of a Healthy Cooperation! We have made it our mission to learn about and from water and to teach it! Let us join together and make a communal effort to save our water, so that it will be here in a healthy condition for future generations and be available to all. So, now you have learned much about the effects of the AQUADEA vortex cells and the energy fields which they create. We have recognized this potential and it is our Vision to use this for the benefit of everyone. When all of us, who have the AQUADEA vortex cells as shower heads, or in the form of a tap water module or as a gateway, let the water run as described every Friday during the time of 15 h to 19 h, a superordinated, connective energy field will arise. This global field can then become an impulse for a natural and higher structure of order. Here nature itself can connect up and receive an impulse to regenerate. Please do not be hesitant and worried about “wasting your water” this way! Your flowers will be very happy to receive such water and the cleansing processes of waste water, as well as the work of purification installations, will be accelerated through and benefit from this. In the spirit of unity, we hope to have afforded you a small insight into our technology and philosophy. Please enjoy your new water experience! 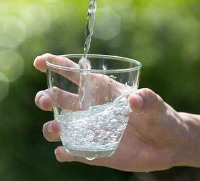 For drinking water we have 3 different models, each with the same filter cartridge. They vary in price and aesthetics. A simple and very hygienic quick-change system to prevent contamination. b) a Japanese hollow fibre membrane with 0.1 micrometer as germination barrier. For actually germ-free water - approx. 8000 litres per cartridge. Flow rate approx. 3 litres per minute at 3-4 bar pressure. Here you will find deeper informations about the filter technology. This is the material level. Then comes the vortex level, where we can effectively extinguish old information structures by implosion and get an enormous amount of vital energy into the water. We practically take the water out of its apathy and reconnect it with the soul of the water. We have an analysis here, but unfortunately only in German. The pictures may be meaningful for you. This water has a very powerful healing and cleansing effect. Almost immediately noticeable while drinking the first glass. In addition to the implosion, we have integrated the Holy Geometry, the Golden Section and the natural growth curves into the technology. For a connection to the basic structure of nature. So did Mr. Schauberger, but it can hardly be found in his descriptions. Furthermore, we use pure crystals exactly at the vertebra's reversal point and thus in the central area of the implosion. The type of crystal brings a different overtone into the water. This following model with real wood base and stainless steel can be offered for a slightly higher price. Made in Germany, with German wood, varnished. It is slightly heavier than the plastic model and has a smaller footprint. b) Trinity with 3 parallel crystal vortex chambers and crystal outlet - maximum flow rate: approx. 9 litres per minute The Trinity has overall better water quality test results and is higher in price. In the meantime, we have managed to produce approx. 60 % of the crystal swirl chamber from pure crystal. On the filter models, either a ToneOne or a Trinity can be fitted. Für täglich mehr Lebens-Freude: Testen Sie eine Aquadea Dusche! Achtung: Hier gelangen Sie zum neuen Shop für Aquadea–Produkte! Rufen Sie uns doch jetzt gleich an! Lieber Interessent, möchten Sie mit uns in Verbindung bleiben? Manchmal kommt Freude auf, wenn etwas in der Ferne Verschwundenes wieder auftaucht. Danke ! Wir freuen uns.